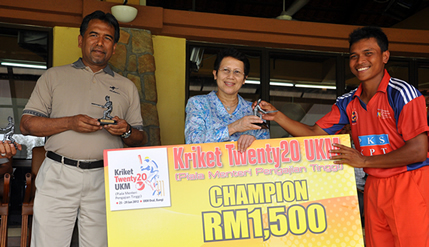 KLANG, 29 Jan. 2012 – The National University of Malaysia (UKM) team has once again emerged the champion in the Twenty20 Cricket Championship for the Minister of Higher Education trophy at the Bayuemas Oval here today. It defeated the Asia Pacific Univerity College of Technology and Innovation (UCTI) team by seven wickets in the final. The third place was jointly held by Multimedia University and the MARA Institute of Technology University (UiTM). A total of eight teams from various instutions of higher learning took part in the championship. The UKM team received the challenge trophy, the Minister of Higher Education Trophy, certificates, medals and a cash prize of RM1500. The runner-up received medals, certificates and a cash prize of RM800 while the third placing teams received medals, certificates and cash prizes of RM500 each. Suhan Kumar from UKM with 38 runs not out was judged the best player in the final while Ahmad Faiz Mohammd Nor also from UKM was declared the best overall player with a total of 153 runs and taking seven wickets. The prizes were presented by UKM Vice Chancellor, Prof Tan Sri Dato’ Wira Dr Sharifah Hapsah Syed Hasan Shahabudin. Deputy vice Chancellor (Students and Alumni Affairs) Prof Ir Othman A. Karim; Director of Sports Centre, Dr. Tajul Arifin Muhamad and director of Security, Kol Jury Tasripan and members of the Malay Cricket Association were present.